If you haven't been to Bali recently (or at all), things are really heating up in the local culinary scene. There's been an influx of local and international talent (with a good number of Aussie chefs) breaking new ground with Indonesian, Asian, French, and Italian cuisines and it's pretty much to the point where you can spend a full week's holiday hitting an amazing restaurant every night. Back in November we popped over for ten days to celebrate our wedding anniversary and I made it my mission to find out just what the fuss is all about. Here are the standouts from our trip. And a word of warning: they all require bookings and you'll struggle to get into most of them with less than a day's notice. If you're looking for top authentic Indonesian cuisine, Merah Putih is one of the top places. We are always happy to hit the local cafes and "warungs" but we decided to see what was being done with local dishes in one of the top restaurants on the island. And we weren't disappointed. Firstly, the space is simply wonderful, with its expansive interior and runway-like raised platform from the kitchen. It's air conditioned, which helped after a long, hot day at Potato Head. And the service was just right - friendly and inviting but professional. We had the Jangkang (fried soft-shell crab) and the Krengsengan Sapi (slow roasted beef cheek) amongst some other dishes. Have what you like but at this location and at these prices I'd recommend you save space to try a number of the dishes. Highly recommended. This was our second time to Sarong, the first being back in 2012. Not much has changed in that time and to be honest, that's a great thing. We booked a couple weeks beforehand for our anniversary dinner as we knew it was one of the standouts we wanted to visit on the trip. Sarong is the sister restaurant to Mama San, the brainchild of Chef Will Meyrick. I'm not sure it's their intention but, in my view, it's a bit more formal than Mama San but the food is quite different. There's a great mix of Asian infused dishes and some top cocktails to go with it. The grilled scallops were really good but the standout for us was the betel leaf with tuna tartare. It was so good that I bought Will's cookbook on the way out to recreate it at home! No aircon as it's open air but that's not a drama if you take a taxi there - and if not, quickly start with an ice cold cocktail to cool things down. As always, book in advance. Metis was an interesting one. On one hand, we read some reviews that questioned the appropriateness of French cuisine in the hot, tropical climate - one was even flummoxed as to why you'd have a foie gras menu in Bali. But a friend and his partner went earlier in the year and they recommended it, so we gave it a try. When in France, eat escargot! I loved them, although I still can't get the Gourmet Female to give them a go. There are a number of great options on the menu but I moved in on the dish that gets all the rave reviews - the 14 hour pork belly. I'm a massive pork belly fan, so I'm an easy mark but this was one of the best I've had globally. Definitely a standout dish and definitely worth the trip over. And the best part? An after-dinner wander through their rice paddy to enjoy the night breeze and the enticing view back into the restaurant. Admission: Our dinner here was included as part of our package at the Double Six Luxury Hotel. But to be honest, we left feeling quite happy that we visited (walking through the rain, no less!) as it wasn't on our radar going in. And I was very impressed that Chef dropped by a couple times to see how we were going and what we thought of the food. He obviously takes pride in what he does. As I mentioned, we went at night in the rain so we missed out on the spectacular view of Double Six Beach. So if you do get a chance to book a table around sunset, do it! There are a lot of good options on the menu but the standout for me was the "pork three ways". Did I mention that I have three pork related t-shirts in my wardrobe? Seminyak Italian is another one that we probably wouldn't have visited if it wasn't in our hotel (and one dinner was included in our package). Besides the fact that we also had breakfast each day there included, we went on our own for a second dinner - so you know it's pretty good. First, the breakfasts. We loved them. A great array of egg dishes, fruits, and other types of international day-starters. I made it a point to begin each one with their espresso granita, which is worth the visit by itself (but probably a culprit in my 2kg addition). Now, you're probably looking more for dinner options in Bali than breakfast and you won't go wrong by adding Seminyak Italian to your itinerary. I'm always a bit dubious about doing Italian in Asian locales but with Robert Marchetti designing the place, you know it's going to be authentic. So, people, here it is. The non-Indonesian dish of the trip, “Granchio alla Veneta”. That's hand-picked crab meat, with a hint of chilli, mascarpone polenta and lemon. This is cry-with-joy-that-you're-alive-and-can-enjoy-this good. I've spent hours trying to recreate it at home and I'm still not there. Please, when I die, cover me in this. As I mentioned earlier, Mama San is the sister restaurant to Sarong, designed by Chef Will Meyrick. I found it to be a more laid back place, with different but just-as-amazing Asian fusion dishes. It's air conditioned, which is great after a day walking around shopping. There are great things here, from the soft shell crab to the crispy pork ribs and we tried a number of them. The standout was “Dhania ghost” lamb, which is cooked with green chili yoghurt and fresh coriander. If you've been to Billy Kwong in Sydney you know where this place is heading. Well, ladies and gentlemen, I've saved the best until last. Ginger Moon. If you're in Bali, you MUST make your way over and try out Chef Dean Keddell's food. We happened upon the place through a couple blog reviews but in retrospect, no one really captured just how great this place really is. The best part of Ginger Moon was their hospitality. As I'm known to do, I tweeted to the Chef after the meal to pass on my thanks and compliments. 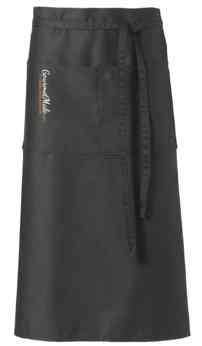 And I got a little bit of courage (see Mugaritz) and asked if I could buy one of their cool aprons. Much to my surprise, they obliged on our second visit. And now I have a little tangible gem to remember the place - beyond all those tasty memories.